Revit geolocation is used to define the geographic location of the project in the real world, so functionality such as shadows, views, and light availability can be used in walkthroughs. 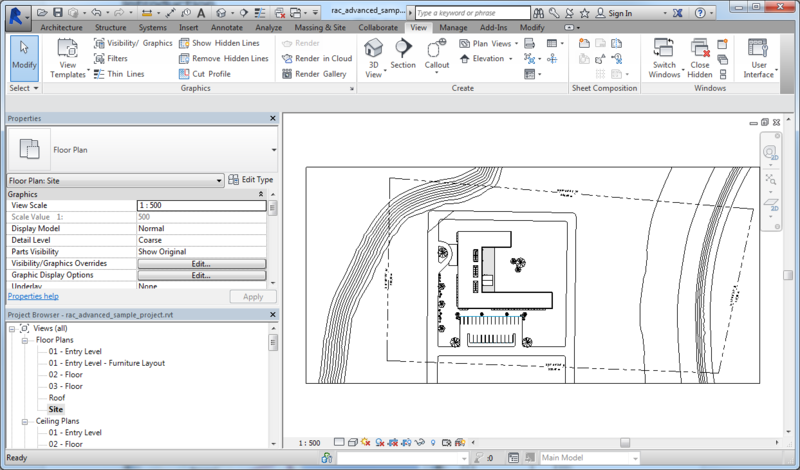 There are two types of geolocation you are likely to encounter in Revit files: Location and Survey Point. FME’s Revit reader assumes that the Location method is being used, but you can switch to using Survey Point by simply changing the source coordinate system on the reader. In this tutorial, we will explore the two different methods of geolocating our Revit project. A Revit file can be downloaded from buildingSmart Alliance’s Common Building Information Model Files and Tools. Download the file ‘2011-09-14-Duplex-RVT’ from Project 1: Duplex Apartment. Feel free to use your own Revit file or any building sample projects provided by Autodesk Revit. This tutorial is not source data specific. To determine which geolocation method is being used will require opening the original Revit file and examining the Site view. If no Site view is available, any other top-down view will suffice. A sample Revit project in Site View. Site View can be accessed from the Project Browser. 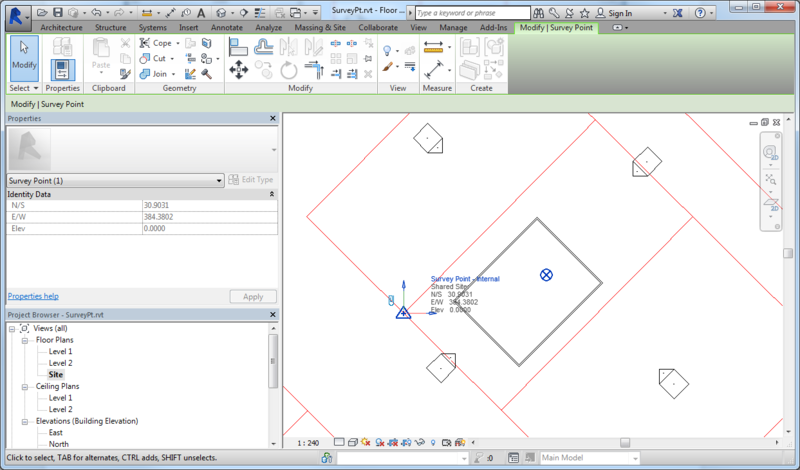 In this case, the Project Base Point and Survey Points are not turned on in the view. To turn them on, pick Visibility/Graphics from the View menu. Access Visibility/Graphics on the ribbon from the View menu bar tab. In the Visibility/Graphics Override dialog, scroll down to Site, expand it, then check both the Project Base Point and Survey Point entries. Make sure Site, Project Base Point, and Survey Point are toggled on in the Visibility/Graphic Overrides for Floor Plan: Site. 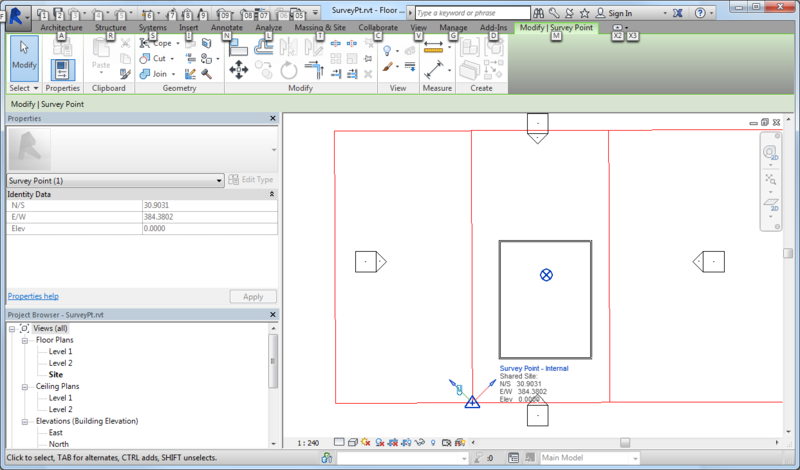 The Site View in Revit with the Project Base Point visible. The Survey Point is also visible (blue triangle with dot) in this case, but is not always. A closer look at the Survey Point marker (triangle), and the Project Base Point (circle). The location dialog displayed next to the model. 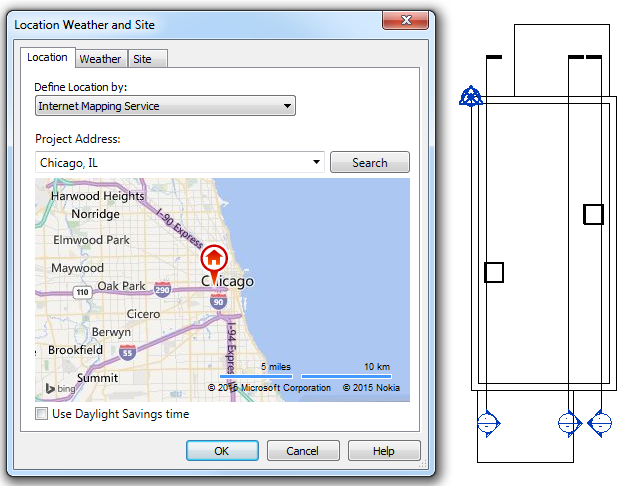 The location of the Revit model can be set in the Location Weather and Site dialog (Go to Manage > Location from the Revit menu). When exported to IFC or FME Export, this is set as the Site location. The FME Revit reader will create a local coordinate system based around this lat/long, using the file units. However, this location is an approximate location used for lighting and weather settings rather than as a precise location in Revit. Instead, the Survey Point is used to set an accurate and known ground location to tie the model to. If you see that the Survey Point and Project Base Point are coincident, as in the image above, then the Survey Point has not been tied to a ground location, and the location setting is the most precise available. In this case, the default FME Revit reader settings are sufficient. The Survey Point (bottom left) and the Project Base Point (inside the building) in different places. In the image above, the Survey Point has been snapped to the corner of the property line, and had its location set to corner ground coordinates. As well, the Project North has been rotated to be square to the property line, which is actually aligned 45 degrees to True North. The building positioned in a real-world alignment. No action is required - this is the method FME assumes has been used. Both the IFC Export and the FME Export use the Shared coordinates for the feature locations, which are offset to the Survey Point location and aligned to True North, and so the coordinate values will be correct. However, FME’s local coordinate system is derived from the Location setting in the Revit file and will not be valid for the coordinates. The SurveyPt.rvz file displayed in the FME Data Inspector. All FME readers allow you to override the file coordinate system. When the Survey Point has been set to a ground location, the coordinate system override should be set to the coordinate system of that ground location (ie. State Plane, UTM, etc.). If the Survey Point is set, but you don’t know the coordinate system of the ground location, you can use FME’s arbitrary coordinate systems (XY-*). For example, XY-M is an arbitrary coordinate system with a unit of meters. This will prevent FME from using the incorrect Location based coordinate system, and allows converting to formats that require a coordinate system be set on the features. The main difference between the Location and the Survey Point Methods is accuracy. Location is the default approximation that is used for weather or lighting settings, while the Survey Point method requires a coordinate system to be defined and allows for the accuracy needed in Surveying. Data was obtained from buildingSmart Alliance’s Common Building Information Model Files and Tools, Project 1: Duplex Apartment file, 2011-09-14-Duplex-RVT.